The other popular place in Bali is Kuta Beach. For tourists domestic and foreign tourists, enjoying the sunset on the island of Bali will not be complete if you have not watch the sunset at Kuta Beach. Kuta Beach is totally different from the Sanur Beach is more desirable because of the beauty of the rising sun (sunrise). Apart from sunset panorama, overlooking Kuta Beach is also quite impressive, the line curved crescent-shaped beaches with white sand along the + 2 km. 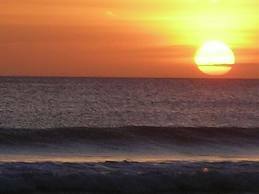 So this is Kuta Beach, The Beautifull sunrise and sunset.. !!. Prior to blossom into a leading tourist attraction, formerly Kuta Beach is one of the trading port on the island of Bali which became the center of the earth's marketing of inland communities with buyers from outside. In the 19th century, Mads Lange, a Danish merchant, settled and established a trading base at Kuta Beach. Through negotiating skills, Mads Lange became intermediaries trade between the kings in Bali with the Dutch. 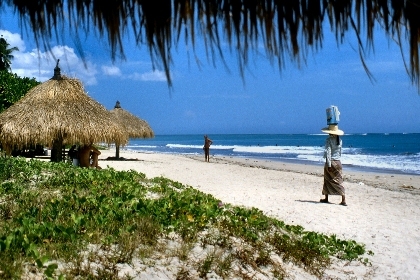 In its development, began the famous Kuta Beach after Hugh Mahbett published a book entitled Praise to Kuta. The book contains an invitation for local communities to set up tourism facilities in order to support the development of tourist visit to Kuta Beach. Through the book, the discourse about the development of tourism facilities gathering popularity, so the construction of lodging, restaurants, and entertainment venues is increasing. As the most popular beach in Bali, the pulse of tourist activity at Kuta Beach went from morning until early morning. In the morning, Kuta Beach is visited by tourists who want to breathe fresh air, just take a walk, or look for breakfast. By day, the tourists, both domestic and foreign ordinary scenery while sunbathing on the beach. There are also families who bring their children to play or swim in the beach sand. If the late afternoon, generally increases the number of tourists to witness the charm of this beach, the sunset (sunset). When night had spread, the atmosphere is more lively Kuta Beach change with the atmosphere of night life (night life) are concentrated in a number of places of entertainment. Another attraction, Kuta Beach has great waves are a challenge for tourists to do sports surfing (surfing). This place is too often become a national surfing competition arena and the world stage. Nevertheless, Kuta Beach is also suitable for beginners just learning to surf. Kecamatan Kuta, Badung regency, Bali province, Indonesia. To go to Kuta Beach, tourists can start the journey from Denpasar City. From the provincial capital of Bali Kuta Beach is located approximately 11 km south. From Denpasar tourists to use public transportation (taxi or bemo) with long travel about 15-20 minutes. As a center of tourism destinations on the island of Bali, Kuta Beach has a variety of support facilities, one of which is a training center and equipment rental surf. For tourists who want to learn to surf, this beach is available at the special places that rent surfing equipment and guides as well. On the beach is also available entertainment arena, such as bungy jumping, water boom as well as other gaming arena. Also, along the Kuta Beach there are many cafes, bars, pubs, discotheques, as well as live music event that is always crowded by the tourists to spend time or just add to the entertainment at night. For shopping enthusiasts, available around the Kuta Beach gift shops that sell handicrafts in various forms, various kinds of accessories, clothing typical of the coast, as well as T-shirts. In the near Kuta Beach there are also supermarkets, hotels, guesthouse, as well as food stalls and restaurants that serve a variety of cuisine with local tastes and flavors globally.